(Phys.org) -- Researchers at the Hawai'i Institute of Marine Biology (HIMB), an organized research unit within the School of Ocean and Earth Science and Technology, have made a remarkable discovery in an international collaboration with University of California at Davis, Simon Frasier University and the University of Sydney Understanding the processes that create and maintain biodiversity, such as when and how new species form, remains one of the greatest challenges facing biologists, conservation scientists, and managers today. These processes are especially obscure in the ocean, where many organisms have tiny juvenile larval stages that swim in the plankton for some time before settling into a largely sedentary adult. This larval stage has the potential to disperse over great distances and keep populations very well-mixed, thus decreasing the chance for speciation. On the other hand, larvae also have the opportunity to disperse great distances to colonize new habitats where they may adapt and perhaps even evolve into a new species. This process usually takes hundreds of thousands to millions of years. 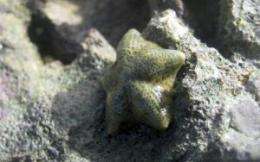 In a new study released in July 2012, researchers discovered that two species of sea stars evolved only 6,000 years ago, during a period of rapid environmental alteration. In the process, one species changed from the ancestral form with separate sexes that release eggs into the water for fertilization. The new species, Cryptasterina hystera, lost the planktonic larval stage all together, and changed from having separate sexes to being hermaphroditic (organisms that have both sexes). This species now carries juveniles internally until they give birth to live young, and has the potential to self-fertilize. This shift in reproduction has dramatically reduced the genetic diversity of C. hystera to levels that are on par with many endangered species. Additionally, populations of this species are genetically different among tide pools only meters apart from each other. This rapid speciation in response to environmental change means that some may have the potential to adapt to future climate change. Eureka. More proof evolution is real. Add this to the pile. And proof that rapid changes in terrestrial and marine ecology can lead to rapid speciation. Does anyone have a name for the opposite of extinction of a species? Proliferation? It's not an exact oppostite, but close. "researchers discovered that two species of sea stars evolved only 6,000 years ago"